A Path to Tranquility - Luxuriously appointed Cottage with private backyard. A path less taken than chosen: to be attracted to the tranquil spot is to listen with the heart. This KaMilo property functions as a rental, but serves as a respite. Enter, and release yourself to the message of Mauna Lani living waiting for you. It’s simple, really. 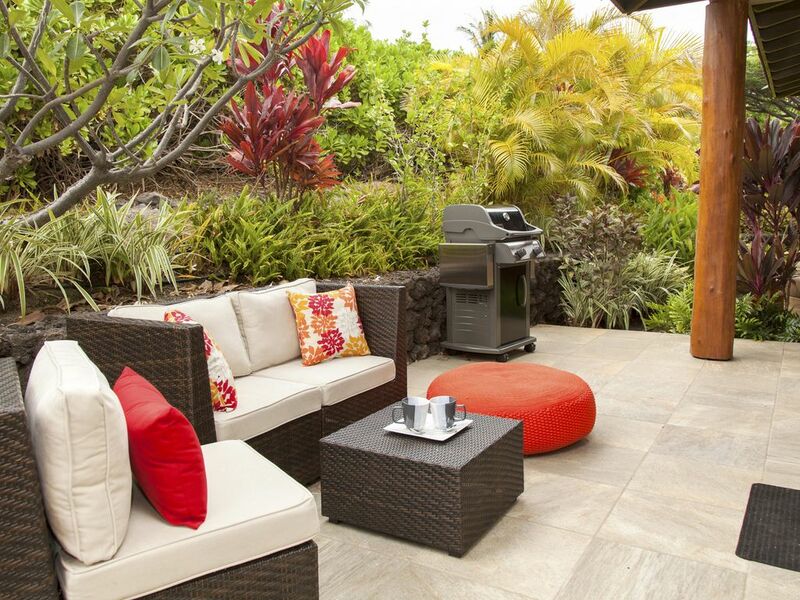 Bedrooms and bathrooms provide the ultimate in shelter, kitchen and sitting areas afford the gathering place for memory-making, and exteriors draw the outside in, until they entice and pull one out to the beautiful Big Island way of outdoor living. This Cottage home accomplishes all this with quiet influence and confidence. This stunning sublime nature is really not that complicated. From the welcoming entry into the great room, the traveler discovers the sanctity of the main event of this cottage. From central island in the modern kitchen, to the ample dining and seating areas, the moments of one’s holiday begin to weave with the aroma of Kona coffee and Grilled Mahi Mahi, the clink of stemware, the rustle of palm fronds in the warm breeze, and the “Ahhhs…” of refined relaxation in repose. The abundant living area provides luxury for conversation and pretending to read while napping, with wide-open views of the secluded lanai that is surrounded in lush tropical greenery and furnished with inviting pieces. The dining table matches with the island bar stools for ample seating, where food never tasted as good. The Master Suite is in a wing of its own, situated to allow the visitor a chance to enjoy their own lanai for morning meditation as they awaken from their King bed, and their own deep soaking tub for evening leisure and rest. Double vanities, generous closet, and walk-in shower complete the open-concept of the expansive retreat’s en suite. Two Guest Bedrooms, each matched with their own en suite bathrooms, flank the other side of the great room. Privacy was never better planned. When venturing out, one can stop just steps from home at the KaMilo Recreational complex, complete with free-form pool and hot tub, fitness lap pool, fitness equipment room, and gathering pavilion. Move along further, and the Mauna Lani Beach Club affords renters the same gated privilege as the residents to its calm scallop-shaped sandy cove, where snorkeling is easy, and easily on par with many sites further afield on the island. From the Mauna Lani home base, your adventures are never out of reach. From Polulu Valley to Paniolo horseback riding, from Waipio Lookout to Waimea Farmers Markets, from Mauna Kea Mountain to Mauna Kea Beach, from Kona fishing, diving, and shopping, to Kona coffee plantation tours – your Big Island experience is custom-made. We haven’t even mentioned the golf island-wide!! When you tire of anything off site, the Shops at Mauna Lani provide variety in clothing, jewelry, home décor, dining, and cultural entertainment and crafts. And, finally, a tranquil sunset from either the Mauna Lani or Fairmont hotels will prove that no vacation lasts forever, but the best vacations feel eternal. We had an absolutely wonderful stay on the Big Island. The accommodations were stunning. The unit was clean and had everything we needed. We will definitely stay again. We had a wonderful time in Kamilo 404 with our family. The layout was perfect for us having three bedrooms each with an ensuite. It is close to the pools, golf courses and has access to the beach club. The property was very clean and well maintained. The property manager responded right away to a couple of requests. We would highly recommend this property! We loved our stay at 404 KaMilo. The house was very well equipped and the manager even provides laundry detergent. The house was spotless and the location was a short walk to the pool. Access to the private beach at Mauna Lani was a real treat! The property manager was very accessible and the personal guidebook he put together was very helpful, especially in licaogoid restaurants. Our daughter lives here and this was my 5th visit but still so much to do! We have had many vacation rental experience. This property was by far the loveliest place to be. It is a gorgeous unit, nicely situated, quiet in a quiet neighbourhood. It is well equipped, clean and very comfortable. We found that lovely orange cushion in the picture was on it's last legs, otherwise all furnishings were quite nice. The BBQ needed extra cleaning and this was attended to most timely. Shiwota team were prompt, pleasant and very attentive to our queries. We would love to return and would recommend it to our friends without hesitation. excellent location. the home is beautiful. All i would suggest is having better pots and pans to cook with. poor quality and food would stick. otherwise the entire place is amazing. thank you! VACATION RENTAL DAMAGE PROTECTION: SRP Management offers the following CSA Damage Protection Insurance policies. - $49.00 Vacation Rental Damage Protection with Policy Limit of $1500. - $59.00 Vacation Rental Damage Protection with Policy Limit of $3000. - $79.00 Vacation Rental Damage Protection with Policy Limit of $5000.